If you’re worried about paying for college, don’t be. Our tuition rates are some of the most competitive in Texas and on top of that, more than 70% of our undergraduate students receive financial aid. Find out how you may be eligible for grants, loans and/or the Work Study Program. Financial Aid consists of a variety of programs including scholarships, federal and state grants and federal and state work study programs. Financial aid is offered to students who complete a FAFSA (or TAFSA) based on their eligibility. Funding for grants and work study is limited so it is important for students to complete their FAFSA as early as possible. You should also consider applying for university scholarships as well as searching for outside scholarship opportunities. Below is a list of the different financial aid programs available at A&M-Commerce. Scholarships are sources of financial aid which do not have to be repaid. These can be from both the university as well as outside sources. Work study is a need-based financial aid program available to qualifying undergraduate and graduate students. The funding is limited. Students with a work study award in their financial aid package can apply for work study student employment opportunities once they complete the required work study training and obtain their work study permit. The application period begins on October 1 of each year for the following academic year. Students are encouraged to complete the FAFSA as soon as possible for each academic year. Once you are fully admitted, we will process your financial aid application. You will be notified of your financial aid award once all necessary documents are received and processed. Classified as a Texas resident. Eligible to pay the Texas in-state tuition rate, not due to waivers such as an in-state scholarship or an assistantship. Students who are not able to complete the FAFSA due to their immigration status may be able to file the TASFA. To receive the best possible combination of financial assistance, an applicant should submit all required application forms to the Financial Aid and Scholarships Office by the priority deadline dates listed below. Applications received after these deadline dates are awarded based on funds available. Not ready to complete the FAFSA just yet? The FAFSA4caster is a great early eligibility estimator to help you plan ahead when understanding the costs of college. Financial aid applications for the 2018-2019 year need to be received in the Financial Aid and Scholarships Office by June 15, 2019. Due to the various processes required, applications will not be accepted after June 15, 2019. Financial aid applications for the 2019-2020 year need to be received in the Financial Aid and Scholarships Office by June 15, 2020. Due to the various processes required, applications will not be accepted after June 15, 2020. Can I change jobs during work study? Yes; however, you must bring back your work permit from the first job. Once you bring it back, we can issue you another permit to be used at the second position. You cannot work as work study at a location, unless they have a work permit on file for you. Can I work in two locations? No, it is not possible to work in two locations at the same time. Do they take taxes out of my check? This question is best answered by the professionals in the Human Resources Office. This can also be viewed on your Single Sign-On (SSO) account found at sso.tamus.edu. To log on you need to know your UIN which can be released via the Human Resources Office. Do you consider special circumstances when reviewing the FAFSA? The data on the FAFSA is a snap shot of the financial circumstances a student and if applicable, parents demonstrate at the time the FAFSA was submitted. The Office of Financial Aid & Scholarships understands that snap shot can change and special circumstances lend themselves to having the student’s eligibility for financial aid be reassessed under certain conditions. There are a variety of special circumstances categories that our office may be able to make through the professional judgment process, as allowed by federal regulations. Students who experience changes from when the FAFSA was originally submitted should consult the Special Circumstances Forms available on our web site to determine what, if any categories are applicable. Does academic probation/suspension affect my financial aid? If you are receiving financial aid, your academic status will affect your financial aid eligibility. Please refer to the Financial Aid Standards of Progress information on the Financial Aid and Scholarship website. How am I classified if I have less than 12 transferable hours? If you have less than 12 transferable hours or you are a high school student with college credit (no matter how many dual-credit hours), you are still considered a freshman and must follow the freshman application procedures. How are Pell grants dispursed? All students receiving financial aid must meet the disbursement requirements of each aid program awarded in order for aid to be disbursed. Enrollment is verified on census date for each semester. Dropping classes, withdrawing, or registering for fewer hours once awarded and financial aid is released will result in a change in the amount of your financial aid for the semester or complete cancellation of your financial assistance. Below is a chart explaining the disbursement requirements for each aid program. (The Pell grant is listed separately due to its unique and very specific requirements). The amount of Pell grant you may receive is based on the number of hours the student is enrolled in at the time of disbursement. The Pell grant is federally funded “gift” aid and is not normally repaid, however, if a change in your enrollment status occurs prior to the census date (full-time to 3/4 time or less), you will be responsible for repayment of the difference between the amount you received and the amount specified for the new status. Withdrawal from all courses after the census date may also necessitate repayment. The amount of TPEG you may receive is based on the number of hours you are enrolled in at the time of disbursement. The TPEG is state funded “gift” aid and is not normally repaid, however, if a change in your enrollment status occurs prior to the census date (full-time to 3/4 time or less), you will be responsible for repayment of the difference between the amount you received and the amount specified for the new status. Withdrawal from all courses after the census date may also necessitate repayment. Click Here to view a Video Tutorial about what to do if Financial Aid is not available when tuition is due. Type of Aid Minimum number of enrolled hours to be eligible Can dropping classes change my eligibility? Can withdrawing from the university require repayment? Credits are assessed by the Office of Admissions and may be reviewed by department heads or deans. Only college- level courses with a grade of “D” or better will transfer. Courses with grades below “C” may not count towards your major. Transferable credits will be awarded upon completion of an evaluation. Apply using ApplyTexas and choose Texas A&M University-Commerce as your school of choice. FRESHMEN: Complete high school transcript through your junior year. Dual-credit freshmen must also submit an official transcript from the institution that offered the dual-credit classes. TRANSFER: Official transcripts from all previously attended institutions. INTERNATIONAL: Transcripts must be evaluated by an independent credential evaluation agency before being considered for admission. FRESHMEN: Use the A&M-Commerce codes, 4088 ACT and 6188 SAT, to submit your scores on act.org or collegeboard.org. How can I recover my FSA ID & Passwords? FSA ID and passwords are under the domain of the Department of Education. While the university does not have any access to reset or recover this information for you, the Department of Education can help you. How do I unlock my FSA ID? How do I accept my award offer? Step 1: Click on the Student Resources tab and scroll down to Financial Aid Information. Select Financial Aid Award Menu, Award for Aid Year, select the appropriate Aid Year from the drop-down menu and then hit Submit. Step 2: Select the Resources/Additional Information tab, answer the question(s) and then click on the Submit Informationbutton at the bottom of the page. You will only have to answer this question once per aid year. Step 3: Select the Terms and Conditionstab to accept or decline the terms and conditions. You will not be able to accept your awards unless you accept the Terms and Conditions. You will only accept the Terms and Conditions once per aid year. You will need to complete the Loan Entrance Counseling and a Master Promissory Note (MPN). Otherwise, the funds will not credit to your student account. How do I apply for financial aid after getting an admission? First complete and return the Free Application for Student Financial Aid to the Department of Education. Second check with the school’s financial aid department to complete any required documentation. Then complete and return all required forms to the financial aid office of the particular college/university. How do I contact the Office of Financial Aid & Scholarships? How do I get a copy of a tax transcript? Tax transcripts must be requested directly from the IRS. Unfortunately, this is not a document that your tax professional has. The easiest way to get a copy of the tax transcript is to visit irs.gov. Once you have navigated to the site the “Get Transcript by Mail” process is easier. Please note that the Get Transcript Online process is more difficult. In most cases, your student may also use the Data Retrieval Tool on their FAFSA to download the information form the IRS. How is financial aid need determined? Expected Family Contribution (EFC) is the amount a student and parent(s) can reasonably be expected to contribute towards educational expenses. The actual amount of the EFC is dependent upon family and student income, assets, family size, number of family members in college, taxes paid and age of the older parent. A student’s EFC is determined by the information provided to the U.S. Department of Education through the Free Application for Federal Student Aid (FAFSA). All applicants are required to inform the Office of Financial Aid and Scholarships of any additional assistance to be received from outside sources during the application period. For example: VA Benefits, Outside Scholarships, and assistance from Texas Department of Assistive and Rehabilitation Services. Students should be aware that there are outside scholarships, teacher aide exemptions, Resident Assistants (RA’s), employee scholarships, Veteran Benefits, Texas Department of Assistive and Rehabilitation Services, and outside grants that are considered resources and can affect a student’s financial need. These resources must be considered in your financial aid and scholarship award package. The maximum number of hours per week you can work is an average of 19 hours per week while classes are in session. If your department allows it and you have sufficient work-study funds available, you may work up to 40 hours during the fall, spring and summer semesters, but only if you are going to be enrolled in the summer semester. The actual number of hours will depend on your work-study award. How much money have I made so far? You can only earn up to your awarded amount as specified in your award letter and on your work study permit card. You can see how much you have made in a year via logging into your Single Sign-On (SSO) account found at sso.tamus.edu. To log on you need to know your UIN which is issued by the Human Resources Office. View this information in the Payroll Data tab. You must submit your hours worked through Workday located in your Single Sign-On (SSO) account found at sso.tamus.edu. To log on you need to know your UIN which is issued by the Human Resources Office. If you do not submit your timesheet by the date required, you may not receive a check for the pay period. I applied for a previous semester and was accepted. Will I be accepted again? If you applied as an incoming freshman or a transfer student and have since attended another institution, we need those transcripts to verify your GPA before an admission decision can be made based on your new application. International students are required to show proof of financial support through bank and sponsor statements. Financial aid and/or assistantships should not be relied on for funding of housing or education. Approximately 75% of our students receive financial aid. What are the financial consequences for withdrawing? If you are considering completely withdrawing from all your classes, you need to know how this can affect your financial aid and much more. If you do not meet SAP standards, you will lose your financial aid eligibility. Students that completely withdraw or cease attendance will be placed on financial aid suspension and will not be eligible for financial aid for upcoming semesters. For more details – Satisfactory Academic Progress. A student who receives financial aid and withdraws from the university may be required to repay all or part of the aid awarded. An application for withdrawal from the university must be initiated with the Registrar’s Office. As part of the withdrawal process, students may be required to secure approval from the Office of Financial Aid & Scholarship. This office will determine if the student must repay all or part of the aid awarded. Calculation of repayment is made at the time of withdrawal by determining the amount of aid the student was awarded, the amount of awarded aid the student earned, and ultimately the amount of awarded aid the student did not earn that must be returned to the aid program(s). If the amount disbursed to the student is less than the amount the student earned, and for which, the student is otherwise eligible, he or she is eligible to receive a post-withdrawal disbursement of the earned aid that was not received. A&M-Commerce begins to release financial aid 10 days prior to the first day of classes for a semester. Students who withdraw from all courses from the first-day financial aid funds are released to Student Accounts through the last day prior to the first day of classes must repay all financial aid disbursed for the semester. *Due to the format of the Organizational Leadership Program, financial aid for students in this program are not part of the 10-day prior release rule. What are the general eligibility requirements for Federal Student Aid? Be enrolled in an eligible degree-seeking or certificate program. Be enrolled in courses that are part of the degree program the student is admitted and actively pursuing. Graduate students who are admitted to two degree programs have a priority 1 degree program and a priority 2 degree program. In these circumstances, the courses registered for in a semester need to coincide with the priority 1 degree program. If the courses registered in a semester coincide with the priority 2 degree program instead of the priority 1 degree program, the priority number of the degrees need to be changed. Students need to contact the Graduate School to make this change. Be enrolled at least half-time (six credit hours). Students enrolled in May Mini will need to also be enrolled in Summer 1 to be considered for financial aid*. Students enrolled in Winter Mini will need to also be enrolled in the Spring semester to be considered for financial aid*. Be in good academic standing and maintainSatisfactory Academic Progress (SAP) toward completion of a degree or certificate. Demonstrate a Financial Need – except for some loan programs. Complete the Free Application for Federal Student Aid (FAFSA) (www.fafsa.ed.gov) and submit any required documentation required for verification. *Payment for May mini or Winter mini courses is due before financial aid can be released. Students will need to either pay out of pocket or contact the Bursar’s Office to obtain a tuition loan. Once financial aid for the particular semester is released the Bursar’s Office will apply it to the tuition loan and any other current debt to the University. What deadlines do I need to remember? What if I can’t earn my entire award? If you realize relatively soon that your class schedule will keep you from earning your entire award, we encourage you to give back any funding you cannot use so that someone else can have the chance to use it. If you don’t use the entire award, the federal government reduces the money it gives the university because our students didn’t earn it all. What if I don’t use all of my money? If you do not use all of your funding, it is NOT saved. In fact, we encourage you to use as much of the money as you can because if you don’t, the federal government reduces the money it gives us because our students don’t earn it all. Parent PLUS loans are unsubsidized federal loans that parents of dependent undergraduate students can use to help pay for educational expenses not covered by other financial aid. Parent PLUS loans are processed through theFinancial Aid Office and are part of a student’s financial aid package. Loan funds are disbursed to the student’s account and applied to pay outstanding charges as needed. The Office of Financial Aid and Scholarships will review the progress of each financial aid recipient for SAP at the end of each semester or term. All terms will be reviewed, including those for which financial aid was not requested. Qualitative Progress in that both cumulative and term GPA requirements are met. Quantitative Progress in that the required number of credit hours is completed each semester or term and that the student has not exceeded the maximum number of credit hours allowed to attempt to complete degree. Students must maintain both cumulative and term GPA standards. All students must complete a minimum of 67% of the number of credit hours they attempted in a semester or term. The following chart states the minimum credit hour completion requirements that all students must meet. The number of credit hours a student attempts may not exceed 150% of the number of credit hours required for graduation in his or her program of study, as published in the University catalog. If the published number of hours required for graduation is 120, a student may not attempt more than 180 credit hours (120 x 150% = 180) and continue to receive financial aid. All periods of enrollment are considered, even those where the student did not receive financial aid as well as hours transferred in from another school. If the number of attempted hours reaches 150% of the hours required for graduation, the student will no longer be eligible for financial aid. To coincide with A&M Commerce’s Graduate College policy, graduate students pursuing a Master’s degree must complete their degree program within six (6) years from the time they are admitted to their respective Master’s program. Graduate students pursuing a PhD program must complete their degree program within ten (10) years from the time they are admitted to their respective PhD program. All periods of enrollment are considered, even those where the student did not receive financial aid as well as hours transferred in from another school. Once the maximum time frame has been reached, the student will no longer be eligible for financial aid. The first time a student fails to meet Financial Aid SAP standards, the student will be placed on Financial Aid Warning Status. A notification will be sent to the student via MyLEO email account. Students will be eligible for financial aid while in a warning status. However, students must make satisfactory academic progress during the semester or term to remain eligible for financial aid. In the event the student does not meet the requirements for SAP while in Financial Aid Warning Status, he or she will be placed on Financial Aid Suspension. Notification will be sent to the student via MyLEO email account. Students will not be eligible for any type of federal, state or institutional aid while in a suspension status. *Students that completely withdraw from all courses in a semester or receive all Fs for a semester will have their aid cancelled for any future aid periods. Students will automatically be on Financial Aid suspension. Students whose eligibility for financial aid has been suspended may appeal the decision in writing to the Office of Financial Aid and Scholarships if they had extenuating circumstance(s) that led to their unsatisfactory progress. An appeal consists of the appropriate appeal form and supporting documentation. Extenuating circumstances consist of but is not limited to a personal illness, medical problems, death in the family, etc. Documentation is required to substantiate the extenuating circumstance(s). Appeals are reviewed by a committee and decisions are sent from the Financial Aid Director to the student in writing to student’s MyLEO email account. If the student is not satisfied with the decision sent by the Financial Aid Director, then the final option for the student is to appeal to the Financial Aid Appeals Committee. This must be completed within 10 calendar days of notification of denial by the Financial Aid Director. The student must request in writing that they would like their appeal to be reviewed by the Committee. The Chair of the Financial Aid Appeals Committee will notify the student in writing of the decision. The decision of the Financial Aid Appeals Committee is final and cannot be overturned. Note: A student will only be allowed to submit an appeal for review three times as an undergraduate and three times as a graduate student. Students will forfeit the right to appeal after the 3rd appeal and will permanently lose financial aid eligibility at A&M Commerce. If the student has exceeded the maximum time frame of 150% of the number of credit hours required for graduation in his or her program of study, as published in the University catalog and is appealing based on a change of major, the student must download the appropriate appeal form and must also their Department Head and Academic Advisor complete the 2nd portion of the appeal form which indicates the number of credit hours required for the major and the number of hours remaining. Appeal will not be reviewed without completion or submission of this form. The student who fails to make satisfactory progress and has appealed their Financial Aid Suspension and has had eligibility for financial aid reinstated is assigned a status of Financial Aid Probation and are able to receive financial aid. Students on Financial Aid Probation may not receive financial aid for the subsequent semester or term unless the student makes satisfactory academic progress or the university determines that the student met the requirements specified in the academic plan for the student. To be considered for financial aid reinstatement for a subsequent term after Financial Aid Suspension, a student must enroll at least half-time (undergraduates-6 hours; graduates-6 hours) for one semester at Texas A&M – Commerce, pay the expenses related to that enrollment and pass the term with a minimum GPA of 2.0 for undergraduate students and 3.0 for graduate students. A student who successfully meets the requirements for reinstatement will be placed back on Financial Aid Probation and will be eligible to apply for financial aid. Two consecutive terms of meeting the standards of academic progress will place the student back in good standing. Financial assistance is usually not provided for repeated coursework. However, if a higher grade for a particular course is required for that course to be accepted to the student?s official program of study, the financial assistance can be provided on an individual basis. Certain courses, in the Department of Music and the Department of Art, though they appear to be repeat courses are not repeat courses. The course needs to be taken several semesters in order to obtain the necessary credit hours within the course. What is the financial aid entrance loan counseling session? Before A&M-Commerce disburses your Federal Stafford Loan (subsidized or unsubsidized), regulations require that you complete a Loan Entrance Counseling and Master Promissory Note (MPN). The counseling session provides information about how to manage your student loans, both during and after college. To complete entrance counseling requirement students must go to https://studentloans.gov. For your records, print the confirmation page that appears after you complete entrance counseling. If your parent is interested in applying for the Parent PLUS Loan, your parent must complete a PLUS application online at https://studentloans.gov by entering parent information first. The application will ask for student information later. A parent PLUS loan application must be completed every award year, similar to the FAFSA to receive. Loan recipients who are receiving their loan money for Fall only or Spring only, are required to have 2 disbursements within that single semester. Half of this money will be disbursed at the beginning of the semester and the other half will be disbursed at the midpoint of the semester. This requirement is a federal regulation. What is the financial aid withdrawal policy? As part of this withdrawal process, students may be required to secure approval from the Financial Aid Office. The Office of Financial Aid & Scholarships will determine if the student must repay all or part of the aid awarded. 1. TAMUC begins to release financial aid 10 days prior to the 1st day of classes for a semester. Students who withdraw from all courses from the first day financial aid funds are released to Student Accounts through the last day prior to the 1st day of classes must repay all financial aid disbursed for the semester. *Due to the format of the Organizational Leadership Program, financial aid for students in this program are not part of the 10 day prior release rule. Adjustments to financial aid will be made according to the enrollment level as of the close of business on Census Day. Therefore, any student who drops classes prior to the close of business on Census Day must repay any financial aid that she/he is no longer eligible to receive. Undergraduate and Graduate students must be enrolled in at least 6 credit hours. 1. Students who drop below half time during registration, late registration, and through the close of business on Census Day must repay all financial aid disbursed for the semester. Federal Pell Grants may be adjusted for part-time enrollment as determined by student’s eligibility. Due to guidance from the U.S. Department of Education, institutions are required to complete a refund calculation for financial aid recipients who fail all courses for the semester. These students are considered by the Federal Government to have “unofficially withdrawn” from the University. The refund calculation determines how much of the federal financial aid a student received for the semester was actually “earned” and how much must be “repaid” by the student to the appropriate financial aid program. The amount is based on the student’s last documented date of attendance. *Students completely withdrawing from all courses in a semester or receiving all Fs for a semester will have their aid cancelled for any future aid periods. Students will be required to submit a Satisfactory Academic Progress Appeal to have consideration for any future aid to be awarded. The policy to return funds due to withdrawal may be modified at any time without prior notice in order to comply with state and federal guidelines. Acceptance of your work study award allows you the benefit of securing a work study position in a wide variety of departments on campus; from working in an office to working on the farm. You can build your experiences while building your resume with real job experience. Step 1: Logon to myLeo to accept your work study award for the terms as indicated. Upon acceptance, it is your responsibility to secure a work study position for the term. Students with accepted work study who have not secured employment within 14 days will forfeit their work study award. Step 2: Contact prospective departments for an interview You may begin interviewing as soon as you have picked up your work permit. Various departments post openings before and during semesters. Available positions, interview and contact information are listed online: Human Resources. Prior to going on your first interview, you must pick up your work study job permit in the Office of Financial Aid and Scholarships. The permit indicates your eligibility for work study. Step 3: Complete the top portion of your work study job permit with your supervisor and return the job permit to the Office of Financial Aid either in person or by campus mail when you accept an offer to work. Your supervisor will keep the bottom portion of the job permit as a record of your employment. Your schedule and work hours will be set by you and your supervisor. Remember you cannot work greater than 19 hours per week. If this is your first work study position, you will be required to complete additional paperwork by our Payroll and/or Human Resource office. Please direct questions to your supervisor regarding these and other general employment issues. Your accepted work study amount indicates the amount per term you may earn during the semester. You will be paid bi-weekly. Choose to have your check mailed to you or direct deposited into an existing bank account. Work study eligibility varies by year. Students who wish to participate in work study must maintain satisfactory academic progress, must renew each year their FAFSA. Completing the FAFSA by the priority deadline provides the best chance of work study eligibility. The Department of Education randomly selects students in a process called, Verification. Verification works as a mini-audit whereby the school collects information and documents from the student applicant and parents, if applicable. Not all students are selected for verification and not all students are selected for schools to verify the same data. Each applicant is selected for specific data to be verified. The Office of Financial Aid & Scholarships requests from the selected applicant documents applicable to the data needing to be verified. Students have 14 days from date of request to submit the documents originally requested. Students are able to view the required documents needed through the myLEO portal; Financial Aid section. The Verification Forms are available on the FORMS tab. Based on the information on the original documents, the Office Verification Team may request additional documents or request clarification if conflicting information is received. With few exceptions, no financial aid is awarded until the verification process is complete. GRANT: A sum of money given by a government or other entity that does not have to be paid back. LOAN: Money that is borrowed and must be paid back. WORK STUDY: A program enabling students to work part time on campus while attending college. When can we expect an award offer? Once a student has met these items, they will be automatically packaged with the most comprehensive offer we have available. Awarding Financial Aid to new incoming freshman students occurs first, usually in mid spring. Awarding Financial Aid to returning students occurs after grades have posted for the spring semester and students are checked for Satisfactory Academic Progress (SAP). When is the first day I can start work? This information is located on your work study permit. Write it down when you get the permit. When is the last day I can work? When will financial aid and scholarships be posted to accounts each semester? The earliest federal and state financial aid can be credited to university student accounts, is 10 days prior to the first day of classes for the semester. Disbursements begin at 5:00 p.m. on disbursement days. Aid will only be released for those students meeting all financial aid requirements in the semester. Disbursement dates are found on the main Financial Aid Website. These dates represent the earliest your financial aid will be released to the Bursar’s Office/Office of Student Accounts. *For the BAAS-Organizational Leadership (TAB) program, where courses are nontraditional and 7-week courses throughout the year, the earliest day financial aid can be released will be specific to the term. Federal loan programs must always have two disbursements in any one loan period. The loan period is the first day of the semester through the last day of the semester. The 1st installment will occur no earlier than 10 days before the 1st class of the semester. The 2nd installment will occur after the midpoint of the loan period or the after the middle of the semester. Check the Financial Aid News and Information page for specific dates. Why am I only getting minimum wage? The department determines how much you will get paid. Theoretically, they pay you based on the position you have. Positions with greater responsibilities can pay more than minimum wage. Why doesn’t my scholarship show up on my account? Then select the appropriate aid year, and “Submit”. This will show you what awards have been offered, accepted, declined or canceled. Why is my financial aid reduced if I get a scholarship or other resources? Need-based financial aid is made available to assist you with the expenses of attending college. Because these funds are limited, the government recognizes that a scholarship or other resource can and does assist you with tuition and fees and other educational costs. Therefore, the government requires that your need-based financial aid be reduced so that you are not over-awarded. Why was my student selected for verification? The verification process is a quality control method used to ensure that federal aid is disbursed accurately. Therefore, the Department of Education uses various models to determine which FAFSAs are selected and then the school is required to verify. The goal of the process is not to deny students aid, the goal is to ensure that all students are getting all of the aid for which they qualify. With some of the lowest tuition rates in the state, we make it easier for veterans like you to earn a college degree. Find out how to make the most of your military training and benefits as you convert that experience into a highly valued education that will enable you to succeed in the marketplace. A&M-Commerce, with the support and cooperation of the Department of Veterans Affairs and the Texas Veterans Commission, is proud and dedicated to serve the veteran students and their dependents in their pursuit of higher learning. Applications for benefits for new and transfer veterans and their dependents can be made online directly to the U.S.Â Department of Veterans Affairs or in person at the A&M-Commerce Student Access and Success Center at 2200 Campbell St, Commerce, TX. Every semester a Request for Certification (PDF) for all VA students receiving the GI Bill must be submitted prior to entitlements starting. Along with the application, veterans must provide proof (DD-214) from the Department of Defense regarding their military service and nature of discharge. Veterans and dependents must also provide proof of eligibility or ineligibility for Montgomery GI Bill benefits (Chapter 33/Post 9/11) by requesting an education benefits letter from the VA office in Muskogee, OK at 888-442-4551 or www.gibill.va.gov. We understand that you may have many questions during the exciting transition of helping your student get settled into our university. We are pleased to provide this page as a resource for our financial aid and scholarship processes. Financial aid is available for students who already hold a bachelor’s degree. Students in any post bachelor’s program must be enrolled in at least 6 hours to be eligible for financial aid. These grants are available for Texas residents and have limited funding. Eligibility is based on financial aid need as determined by completion of the FAFSA. Awards vary based on funding levels for the academic year and student’s financial need. The student must be enrolled in no less than 6 graduate credit hours. Early application is recommended. The Grant may pay up to $1,000 per semester, provided all eligibility is met each year, for up to 2 years or graduation, whichever comes first. The Grant may pay up to $1,500 per semester, provided all eligibility is met each year, for up to 2 years or graduation, whichever comes first. The Grant may pay up to $1,500 per semester, provided all eligibility is met each year, for up to 4 years or graduation, whichever comes first. *Funding for this program for 2017-2018 awards has not kept pace with the growing number of eligible students. Awards are predicated on the availability of funding. We will keep this page updated as new information becomes available. Must be fully admitted into an eligible program. Provisional admitted students areÂ not eligible. Students must submit a copy of their Certification/Deficiency Plan to the Financial Aid & Scholarships Office (Non-degree programs not eligible). Students in these programs may have limited loan eligibility due to loans borrowed to complete their undergraduate degree(s). Certification students should contact theÂ Graduate school and/or theÂ Certification OfficeÂ to confirm full admission. Pell Grants are not available for certification students at A&M-Commerce. Students must contactUndergraduate Admissions to confirm full admission. Educational Testing Service (ETS), which administers the Graduate Record Examination (GRE), makes available to colleges and universities yearly, a limited supply of fee reduction certificates for the GRE, based on financial need as determined by the Free Application for Federal Student Aid (FAFSA). Individuals meeting the eligibility requirements will be required to pay 50 percent of the full test fee. You must be a U.S. citizen or resident alien who is a college senior or an unenrolled college graduate. Self-supporting and has a FAFSA that shows a contribution (EFC) of no more than $3,000 for the senior year. Have a FAFSA that indicates self-supporting status and a contribution of no more than $3,000. The ETS GRE Fee Waiver process has changed. Schools are no longer directly involved as in years past. Students interested in applying for a GRE Fee Reduction Waiver will need to complete the Reduction Waiver and attach a copy of the current FAFSA Student Aid Report (SAR). To view more information on the GRE test or GRE Fee Reduction Certificate click here. How do I apply for FAFSA Financial Aid? You will need to create a FSA ID to electronically sign your FAFSA. If you are a dependent student, your parent will also need to create an FSA ID. It is extremely important to understand the questions on the FAFSA especially with questions regarding whether you are a dependent or independent student. For more information review Determine Your Dependency Status or view the Dependency Status video. If you or your parent has completed your taxes for the appropriate FAFSA year, you may be able to upload the required income information directly from your or your parents IRS tax return to your FAFSA. This step is highly encouraged because it can assist you in processing your FAFSA faster. When you are ready to complete your FAFSA, select “Filling Out a FAFSA” in Section 2. Follow the on-screen instructions. You may also obtain a paper version of the FAFSA from your high school counselor or from the Financial Aid & Scholarships Office. Please note that the paper FAFSA can take 3-5 weeks to be sent to A&M-Commerce. You’ll receive a Student Aid Report (SAR) Information Acknowledgment in the mail about 2 weeks after submitting your online FAFSA. If you provided a valid email address, you’ll receive an email with a link to your SAR information on the web within 5 days. When you receive your SAR, read the comments section and review. If you find any errors correct them. Remember: If you are a dependent student, your parents must sign the correction also. Remember: After you complete the FAFSA, you’re not done yet. After the Financial Aid & Scholarships Office receives your FAFSA, you will be sent an email to your university email account on myLeo. You will then be required to log on to your myLeo account to complete any other requirements before you are awarded financial aid. Complete any outstanding requirements as soon as possible otherwise your financial aid will be delayed and you will not be awarded in a timely manner. *Applications for assistance cannot be fully considered until all of the required application forms are received by the Financial Aid and Scholarships Office and the applicant is fully admitted as a regular degree-seeking student. Contact the Admissions Office for admission information.Â A&M-Commerce officially corresponds with students through their assigned A&M-Commerce email account myLeo. You may qualify for other kinds of scholarships and grants after federal aid is applied. To qualify for low-interest, forgivable federal loans, including a federal parent PLUS loan. It demonstrates your interest in the college and may give you an admissions edge. Federal grants are available to students that meet the minimum eligibility requirements for federal student aid and demonstrate financial need. Students that receive federal aid are required to meet Satisfactory Academic Progresseach semester. The federal Supplemental Education Opportunity Grant (SEOG) is available to only undergraduate full time and part-time students pursuing their 1st bachelor’s degree. Funds are very limited with a priority deadline of March 15thfor the next academic year. Funds are provided per academic year, starting in the fall semester and ending in the summer. Funds awarded in the fall and spring. Any funds awarded but not issued in the fall and/or spring will roll over to make awards in the summer. State grants are available to students that meet the minimum eligibility requirements for state student aid. Requirements for State grants can include Texas residency and graduation from an accredited public or private high school in Texas. Students must meet the required minimum GPA and credit hour completion to be eligible for renewal. Federal Pell Grants are awarded to undergraduate students that demonstrate financial need and who have not earned a bachelor’s or professional degree. Students eligible for Pell Grants are awarded for the entire academic year (Fall/Spring). Pell Grants cannot be awarded to a student at more than one institution during the same semester. Students who receive Pell Grants are awarded at full-time enrollment status. Students with an EFC of 0 will be awarded the maximum pell amount. For complete listing of pell awards based on EFC, please review the Pell Grant Award Chart for 2017-2018 or 2018-2019. All students eligible for Pell Grants are awarded at full-time enrollment status, however, Pell Grant disbursement is prorated based on actual enrollment status. A student’s enrollment at census (12th class day for Fall/Spring 16-week semesters) will be the final enrollment status used for Pell Grant disbursement. A minimum enrollment of 3 credit hours is required for Pell Grant disbursement. Students with higher EFCs that are enrolled in less than 6 credit hours may not receive a disbursement due to proration. See the the Pell Grant Award Chart for 2017-2018 or 2018-2019 for more information. Effective July 1, 2012, students can receive no more than 12 semesters of full-time Pell Grant awards during their academic lifetime. Students that met or are near their lifetime eligibility will receive a notification from the Department of Education and possibly our office. For more information, visit How is my Pell Grant Lifetime Eligibility Calculated? A student is not eligible to receive a TEXAS Grant award if convicted of a felony or an offense under the law in any jurisdiction involving a controlled substance as defined in Chapter 481, Health and Safety Code (Texas Controlled Substances Act). Institutions should consult with their internal legal counsel concerning individual student situations. To comply with this requirement, institutions are required to collect a statement (electronic or paper) from each TEXAS grant recipient certifying that they have no such conviction. Institutions have the flexibility to determine the wording of the statement and the frequency with which it is collected. This statement must be retained with the student’s records at the institution and be made available if requested in the course of a program review or audit. A certificate of discharge by the Texas Department of Criminal Justice or a correctional facility. Completed a period of probation ordered by a court, and at least two years have elapsed from the date of the receipt or completion. Been pardoned and had the record of the offense expunged from the person’s record. *Eligibility ends for all recipients once a baccalaureate degree has been obtained. **Attempted hours is defined as every course in every semester for which a student has been registered as of the official census date. This includes but is not limited to repeated courses, courses the student drops or those that the student withdraws from. For transfer students, the transfer hours and hours for optional internship and cooperative education courses are included if they are accepted by the receiving institution towards the student’s current program of study (See TAC, Section 22.230). The Office of Financial Aid & Scholarships follows the Hardship Provisions for Texas Grant eligibility in cases where a student loses eligibility. A student who is ineligible for a TEXAS Grant award based on the general requirements may be deemed eligible under a hardship provision. There are limitations on which eligibility requirements can be granted a hardship. Each institution must adopt a hardship policy and have the policy available for public review. All hardship decisions must be documented in the student’s record and be available for submission to the THECB, if requested. No student enrolled for fewer than six hours may receive a TEXAS Grant. However, in the event of a hardship or for other good cause, A&M-Commerce may allow an otherwise eligible person to receive a TEXAS Grant while enrolled for an equivalent of six to nine semester credit hours or if the student’s grade point average or completion rate or number of completed hours falls below the satisfactory academic progress requiremnets of Â§22.229 of this title (relating to Satisfactory Academic Progress). Hardship conditions are not limited to, but include the circumstances listed. A showing of a severe illness or other debilitating condition that may affect the student’s academic performance. An indication that the student is responsible for the care of a sick, injured, or needy person and that the student’s provision of care may affect his or her academic performance. In instances where the student has fewer than 9 credit hours to complete their degree plan. In instances where the student and/or the student’s family have suffered a hardship that would now make the student rank as one of the institutions neediest. In instances where the student has received the first award after more than 16 months since the high school graduation. The student will need to provide a written request and supporting documentation of the circumstances which resulted in the loss of eligibility. In cases where the loss of eligibility is associated with the student needing additional credit hours to complete the degree, the student, in consultation with their academic advisor, will complete and submit the Excessive Hours form. IMPORTANT NOTE: Students enrolled less than 6 semester credit hours cannot be considered for hardship and are not eligible for a TEXAS Grant award. While a hardship may be granted to allow an award in excess of 150 attempted semester credit hours, the total number of hours paid for with TEXAS Grant funds may not exceed 150 or 90 semester credit hours. The Teacher Education Assistance for College and Higher Education (TEACH) Grant is different from other federal student grants because it requires admittance into an eligible major and an agreement to serve or work at an eligible educational institution. Failure to follow the terms of the agreement to serve after graduation converts the grant to an unsubsidized loan that must be repaid. TEACH grants are available for undergraduate and graduate students. Disbursement is dependent on student enrollment similar to Federal Pell Grant. All students eligible for TEACH are awarded at full-time enrollment status, however, TEACH disbursement is prorated based on actual enrollment status. A student’s enrollment at census (12th class day for Fall/Spring 16-week semesters) will be the final enrollment status used for TEACH disbursement. Below is a list of majors that are eligible for the TEACH grant provided that students meet the basic eligibility requirements for federal student aid programs. For more information regarding the TEACH grant visit studentloans.ed.gov. Check out the criteria below to see if you should complete the Texas Application for State Financial Aid (TASFA). In 2001, the Texas Legislature passed legislation allowing certain categories of foreign students to meet state requirements for residency. This classification enables these students to pay resident tuition and fee rates while attending public institutions of higher education in Texas in addition to meeting residency requirements for some state financial aid programs. You must hold a visa that enables you to domicile in the United States. You (or your parent(s), if you are a dependent) must be gainfully employed in Texas for at least 12 months. You (regardless of INS status) have petitioned for permanent residency status (have filed an I-130 or I-140). You have resided in Texas for 3 years leading up to graduation from high school or the receipt of a GED certificate, living at least part of that time with a parent or court-appointed legal guardian. You have not established a residence in another state or location and have not taken ANY college hours prior to fall 2001 that required admission to an institution of higher education. (This includes hours taken through dual enrollment while attending high school). Step 2: If you qualify for resident status based on one of the three criteria listed, you are eligible to apply for state aid. Please complete the Texas Application for State Financial Aid. Step 3: Attach the appropriate tax return transcript with W-2s appropriate to the academic year to verify your earnings to your application. Applications for assistance cannot be fully considered until all of the required application forms are received by the Financial Aid and Scholarships Office and the applicant is fully admitted as a regular degree-seeking student. Contact the Admissions Office for admission information. The Work Study program is a need-based financial aid program. Students must complete a FAFSA and demonstrate financial aid need to qualify through this program. The program enables students to not only earn funds to help defray the costs of attending A&M-Commerce which reduces debt upon graduation but also provides the opportunity to develop employment skills and build a resume for use upon graduation. 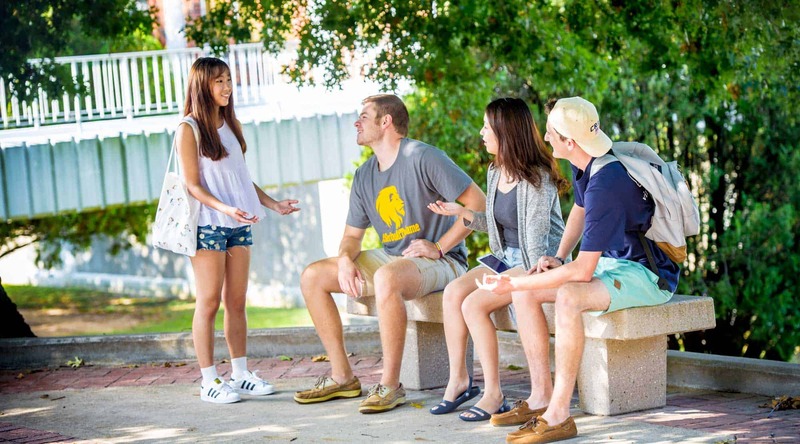 Students are awarded funds based on their eligibility and how much work-study funding A&M-Commerce receives from the federal and state programs. Students that have been awarded work study must complete the following steps in order to complete the process. It is the student’s responsibility to secure employment within 14 days or they will forfeit their award. Step 1: Log on to MyLeo to accept your work-study award. Step 2: Complete Student Work Study Training (Course #2111962). Your work-study permit will be emailed to you after you complete training and your award finishes processing. Step 3: Contact perspective departments for positions. Available job opportunities for students are available online at Hire A Lion. Once hired, additional paperwork will be required from Human Resources. Please direct questions to your supervisor regarding these and other general employment issues. Your accepted work study amount indicates the maximum amount per term you may earn during the semester. You will be paid bi-monthly and can choose to have your check mailed to you or direct deposited. Work study eligibility varies by year. Students who wish to participate in work study must maintain satisfactory academic progress and renew their FAFSA each year. Completing the FAFSA by the priority deadline provides the best chance of work study eligibility. Financial Aid can also include various loan programs. Below is a list of the different loan options available at A&M-Commerce. Loans are sources of financial aid that are offered through the Department of Education or private lenders that must be repaid with interest. If students want to pursue loan(s) offered through the Department of Education, they must complete entrance counseling and sign a Master Promissory Note (MPN) for the appropriate loan type at studentloansin order for this type of funding to disburse to their student account. Please note: completing entrance counseling and an MPN on a student’s behalf or a student completing the wrong entrance counseling or MPN can result in a delay in loan processing. Additionally, parents of dependent students have the option of applying for a Parent Plus loan to assist their student with educational expenses. A private student loan is a nonfederal loan issued by a lender such as a bank or credit union. Private loan applications are completed with the lender and usually require a credit check. Students and parents should always exhaust all federal student loan options before considering a private loan. A&M-Commerce does not have any contractual agreements with any private lender and as such there are no preferred private lender lists, contracts or endorsements of private loans. A&M-Commerce is a Direct Lending school. The primary loans processed by the Financial Aid and Scholarships Office are Federal Direct Loans. Federal Direct Loans have lower costs to you as you pursue your degree and have various repayment options not available through the private education loan market. We are happy to assist with your private education loan processes; however, school certifications of private education loans are not automatically completed by our office. Certification requests cannot be completed for multiple award years on one application. We want to make sure you are aware of the various federal and state financial aid programs which you may be eligible to apply for before the private educational loan is certified. If you haven’t already applied for federal and state financial aid, you’re encouraged to do so by completing the FAFSA. For more information about applying for financial aid at A&M-Commerce, (e.g., grants, low-cost education loans, scholarships, and work-study programs) visit the Financial Aid Office’s website. Before disbursement of any private education loan can occur, an applicant self-certification must be completed. This form is usually part of the application process you complete through your lender. Follow the instructions included in the self-certification form. Enter the “Estimated Cost of Attendance” amount as your cost of attendance on Section 2, Item A of the form. Add the amount listed under “Grants and scholarships to pay for college” with “Work Options” and “Loan Options.” Enter this total amount as your estimated financial assistance on Section 2, Item B of the form. Be sure to include awards for only the terms covered by the loan period. If you have applied for financial aid but awards have not yet been made, report $0. You may wish to delay your private loan until you receive your financial aid award notice because you could receive enough financial aid to replace the private loan you intend to borrow. Complete Section 2, Item C using the formula on the form. Complete Sections 3 and 4 and submit to the lender; do not submit this form to Financial Aid and Scholarships. Graduate assistant teaching (GAT), graduate assistant research (GAR), and graduate assistant non-teaching (GANT) assistantships at A&M-Commerce offer financial support for graduate education. Assistantships may be awarded to qualified graduate students who have full or conditional admission to a master’s or specialist program or full admission to a doctoral program. Assistantships are available in academic and non-academic departments. In addition to funding graduate education, assistantships provide students with opportunities for professional growth. Graduate Assistant Teaching (GAT) assistantships must be under the direct supervision of a faculty member and be an instructor of record for undergraduate courses or be assigned to activities such as assisting with courses or teaching labs, grading assignments and exams, or assisting professors with large lectures and/or online courses. The duties must be attached to a specific course or courses in order for a graduate student to be hired as a GAT. GATs who are instructors of record have primary responsibility for teaching a course for credit or noncredit and/or for assigning final grades for the course. In order to qualify to be an instructor of record as a GAT, the graduate student must have earned a minimum of 18 graduate semester hours in the field in which she or he will be teaching. Although instructor of record, the GAT must work under the direct supervision of a faculty member experienced in the teaching field, receive regular in-service training and be regularly evaluated. GATs who assist the instructor of record with a zero-credit lab associated with a classroom course must have completed twelve hours of graduate or upper-level undergraduate coursework directly related to the undergraduate course being taught. GATs assisting with a zero-credit lab must work under the direct supervision of the instructor of record, complete lab safety, supervision training and be evaluated on a semester basis by faculty. Graduate students whose native language is other than English must demonstrate a sufficient level of oral and written proficiency before they may be awarded a teaching assistantship. Graduate Assistant Research (GAR) assistantships require recipients to aid in the research with the department/professor to which they are assigned. Work may also include tasks such as assisting with labs, offering teaching support, assisting faculty with research, preparing reports, entering data or other responsibilities as assigned. Graduate Assistant Non-teaching (GANT) assistantships are not assigned to a specific course but work in a variety of settings across campus. Responsibilities may be administrative in nature or consist of other activities that do not generally fit within the GAT or GAR job responsibilities. Parent PLUS loans are unsubsidized federal loans that parents can use to help pay for educational expenses. Parents can take PLUS Loans to pay for education expenses of dependent undergraduate students who are enrolled at least half-time. PLUS loans are processed through the Financial Aid Office and are part of a student’s financial aid package. Loan funds are disbursed to the student’s account and applied to pay outstanding charges as needed. Parents may opt to have refunds issued directly to the student – otherwise the refund will go back to the parent borrower. Please direct questions to the Financial Aid Office at 903-886-5096. How do I apply for a Parent PLUS Loan? Go to the Department of Education website. The PARENT will log in using theirFSAID (The same FSAID used to sign the students FAFSA). Complete all requested data and authorize the Department of Education to check the parents credit. Note: Any parent can apply for or retrieve a lost FSAID. How much can I borrow from the Parent PLUS program? A parent can borrow up to the student’s cost of attendance, minus any other financial assistance received. What are the advantages of a Parent PLUS loan? Borrow amounts up to cost of attendance minus any other financial aid received. What are the downsides of PLUS loans? Unlike credit card debt and mortgages, which can be canceled if you file for bankruptcy, education loans of all types must be paid. Most bankruptcy courts will not cancel them unless your situation is extremely dire. What are the eligibility requirements for a Parent PLUS Loan? Parents and students must be U.S. citizens or eligible non-citizens and must not be in default on any federal loan or owe an over-payment on a federal grant. Parent must be the student’s biological or adoptive parent or the student’s step-parent if the biological or adoptive parent has remarried at the time of application. Parent or endorser may not possess an adverse credit history. The student must be under age 24, unmarried and have no legal dependents at the time of application (exceptions apply). The student must be enrolled at least half time. Parents and students must meet the general eligibility requirements for federal student aid. What are the next steps after applying for a Parent PLUS Loan? If eligible to receive the Parent PLUS Loan, the parent must complete and sign a Parent PLUS MPN at the Federal Student Aid site under Sign Master Promissory Note. What if I get denied for the Parent PLUS Loans? If a parent gets denied for the Parent PLUS Loan, the student may be eligible to receive additional unsubsidized loan funds for the current academic year. When do I have to start repaying my Parent PLUS loan? The Parent PLUS loan enters repayment once the loan is fully disbursed. Parents can request a deferment if their child is still enrolled at least half time or for an additional six months after their child ceases to be enrolled at least half time. Please note: If a loan is deferred, interest will accrue during the deferment. When should I apply for a Parent PLUS Loan? Credit decisions are typically valid for 180 days. We recommend applying approximately 30 days prior to the start date of the semester your child plans to attend. This provides time for our office to process the applications and determine eligibility, whether it is through the Parent Plus loan or additional unsubsidized loans (in case of denials). Please, direct questions to the Financial Aid Office at 903.886.5096. Parent PLUS Loan Questions Answered BelowThanks for the info! Are you interested in a summer thesis/dissertation fellowship? Read on! Competition Opens January 2019. Deadline to submit is May 3, 2019. The Graduate School has limited funds to support summer fellowships on a competitive basis for master’s, specialist and doctoral students who are in the final stage of completing their thesis or dissertation. These fellowships are for students who plan to spend the majority of the summer completing their thesis or dissertation and intend to graduate at the end of the summer or fall semester. Each fellowship award will be $1,000. If you are receiving financial aid during the term of the scholarship award, there may be a need to adjust the total financial aid award. Please contact the Office of Financial Aid and Scholarships at 903-886-5096 for additional information about how this fellowship may affect financial aid. Please note that fellowship funding is limited and only complete application packets will be reviewed by a committee for final award determination. Be a master’s, specialist or doctoral student in good academic standing at A&M-Commerce. Have a thesis or dissertation proposal approved by Thesis and Dissertation Services in the Graduate School. The Graduate School must approve the proposal no later than the last class day of spring semester. Be enrolled in at least three (3) hours of thesis (518) or dissertation (718) during the summer of the award. All documents must be sent by mail, email or hand-delivery to the Office of Thesis and Dissertation Services. For additional information or questions, contact The Graduate School/Thesis and Dissertation Services at 903-886-5968 or TDS@tamuc.edu. It is impractical for the aid applicant to expect the total calculated need to be met with gift-aid (grants and scholarships). In order to meet as much of the documented need as possible, the applicant must apply for self-help program (loans or employment). An award notice will be sent to the applicant’s myLEO email account indicating the types and amounts of aid offered. You must review your award notification in myLEO and accept or decline all the financial assistance offered to you within 14 days. Failure to do so may result in aid being canceled. Click Here to learn how to accept your Financial Aid Award. Recalculate the applicant’s eligibility to include the additional resource(s). Adjust the student’s award to prevent the over award situation. Adjustments may include canceling or decreasing previously awarded aid. Send a revised email to the applicant indicating any revisions made to the aid package. All dependent students seeking a Federal Parent PLUS loan must have their parent complete the application at https://studentloans.gov/myDirectLoan/index.action. Parents (borrowers) will begin the application and enter their student information later in the application process. Applications that are not completed correctly cannot be processed. Step 2: Select the Resources/Additional Information tab, answer the question(s) and then click on the Submit Information button at the bottom of the page. You will only have to answer this question once per aid year. Based on current laws and regulations overseeing the federal and state financial aid programs, federal and state financial aid can be credited to university student accounts 10 days prior to the first day of classes for the semester, at the earliest. The release of financial aid to student accounts begins at 5:00 p.m. on release days. Below are the financial aid release dates for students meeting all financial aid requirements in the semester. These dates are subject to change should federal and/or state laws and regulations change. Specific online programs have different release dates due to the length of the terms. For the BAAS-Organizational Leadership (TAB) program, where courses are nontraditional and semesters are 7 weeks throughout the year, the earliest day financial aid can be released will be specific to the term. Disbursements occur after business hours. For information about financial aid refunds, please contact the Office of Student Accounts at 903-886-5050 or 903-886-5501. You can also e-mail them, visit their website or visit the Refunds webpage. To remain eligible for financial aid, you will need to meet the Standards for Academic Progress (SAP). Find out more below! The higher education amendment act of 1965, as amended, mandates institutions of higher education to establish a minimum standard of satisfactory academic progress for students receiving financial aid. These standards shall apply to all students receiving financial aid unless the terms of a particular grant provide otherwise. These provisions apply to students who, at any point in their educational career, apply for financial aid. The Financial Aid and Scholarships Office will review the progress of each financial aid recipient for SAP at the end of each semester or term. All terms will be reviewed including those for which financial aid was not requested. Qualitative progress in that both institutional cumulative and semester or term GPA requirements are met. Students must maintain both institutional cumulative and term GPA standards. *Federal Pell Grant eligible undergraduate students may receive a minimum Federal Pell Grant for enrollment of less than 6 credit hours. To coincide with A&M-Commerce’s Graduate School policy, graduate students pursuing a master’s degree must complete their degree program within six (6) years from the time they are admitted to their respective master’s program. Graduate students pursuing a doctoral program must complete their degree program within ten (10) years from the time they are admitted to their respective doctoral program. All periods of enrollment are considered, even those where the student did not receive financial aid as well as hours transferred in from another school. Once the maximum time frame has been reached, the student will no longer be eligible for financial aid. The information below will help you understand the guidelines for Satisfactory Academic Progress (SAP). The first time a student fails to meet financial aid SAP standards, the student will be placed on financial aid warning status. A notification will be sent to the student via myLeo email. Students will be eligible for financial aid while in a warning status; however, students must make satisfactory academic progress during the semester or term to remain eligible for financial aid. In the event, the student does not meet the requirements for SAP while in financial aid warning status, he or she will be placed on financial aid suspension. Notification will be sent to the student via myLeo email. Students will not be eligible for any type of federal, state or institutional aid while in suspension status. *Students that completely withdraw from all courses in a semester or receive all Fs for a semester will have their aid canceled for any future aid periods. Students will automatically be on financial aid suspension. Students whose eligibility for financial aid has been suspended may appeal the decision in writing to the Financial Aid and Scholarships Office if they had an extenuating circumstance(s) that led to their unsatisfactory progress. Extenuating circumstances consist of, but is not limited to: a personal illness, medical problems, death in the family, etc. Documentation is required to substantiate the extenuating circumstance(s). Students who complete a semester with all Fs and submit the All Fs Appeal Request form will be placed on an educational plan immediately following the semester of all Fs. Students who complete the Appeal Request for GPA and/or Completion Hours form may be placed on an educational plan depending on the academic history review. If during the academic history review it is found the student can meet financial aid standards of progress within the next semester, he/she will be placed on probation without the need for an educational plan. If in the next semester of enrollment while on probation the student again does not meet financial aid minimum standards of progress, the student will be required to meet with a representative of the academic advising center and establish an educational plan. The student will agree to the conditions of the educational plan. Should the student not agree to be on an educational plan, the student will forfeit future financial aid. The student will need to reinstate their financial aid through the reinstatement process. Appeals are reviewed by committee and decisions are sent from the financial aid director to the student in writing to the student’s myLeo email. If the student is not satisfied with the decision sent by the financial aid director, the final option for the student is to appeal to the University Financial Aid Appeals Committee. This must be completed within 10 calendar days of notification of denial by the financial aid director. The student must complete the appeal to university financial aid committee form. Documentation must be submitted that supports this request. The chair of the University Financial Aid Appeals Committee will notify the financial aid director of the decision of the committee membership. The financial aid director will notify the student of the committee’s decision. The decision of the University Financial Aid Appeals Committee is final and cannot be overturned. Note: a student placed on an educational plan must follow that plan for the duration outlined on the plan. Should a student not be able to meet the conditions of that plan the student will be allowed only one additional appeal to modify the plan. When a modification to an educational plan is done, and should the student not be able to meet the conditions of the modified plan, the student will forfeit future financial aid. * If the student has exceeded the maximum time frame of 150% of the number of credit hours required for graduation in his or her program of study, as published in the university catalog and is appealing based on a change of major, the student must download the appropriate appeal form and must have their department head and academic advisor complete the second portion of the appeal form which indicates the number of credit hours required for the major and the number of hours remaining. An appeal will not be reviewed without the completion or submission of this form. After a financial aid suspension, if a student chooses to not submit an appeal or if a student has lost all appeal options, a student can reinstate their financial aid for a subsequent term. A student must enroll at least half-time (6 credit hours) for one semester at A&M-Commerce, pay the expenses related to that enrollment, complete all attempted hours for the semester, if enrolling in the minimum 6 credit hours, and obtain the appropriate end of term GPA and institutional cumulative GPA. Undergraduate freshmen students must have an end of term GPA and an institutional GPA of a minimum 1.8; sophomore, junior and senior undergraduate students must have an end of term GPA and an institutional GPA of a minimum 2.0. Graduate level students must have an end of term GPA and an institutional GPA of a minimum 3.0. A student who successfully meets the requirement for reinstatement and all other conditions regarding financial aid standards of progress will be placed back on financial aid probation and will be eligible to apply for financial aid. Two consecutive terms of meeting all conditions of financial aid standards of progress will place the student back in good standing. Financial assistance is usually not provided for repeated coursework; however, if a higher grade for a particular course is required for that course to be accepted to the student’s official program of study, the financial assistance can be provided on an individual basis. Certain courses, in the department of music and the department of art, though they appear to be repeat courses are not repeated courses. The course needs to be taken several semesters in order to obtain the necessary credit hours within the course. Use the handy calculator below to calculate the percentage of classes you have successfully completed! In order to receive financial aid, all students are required to successfully complete 67% of the classes they attempt each semester and cumulatively. NOTE: Summer terms (Summer I & Summer II) are considered one entire semester. Therefore, if you take 3 hours in each term, you attempted a total of 6 hours for the Summer terms. Example: A student registered for 15 hours at the beginning of the semester but dropped a 3-hour class and received an F in another class worth 3 hours means you would enter 15 attempted hours and 9 hours completed into the calculator. The completion rate is 60%. Example: A student transferred from another school with 30 attempted hours but only completed 25 hours. The student then takes 15 attempted hours at A&M-Commerce but only completes 3 hours. The student has a total of 45 attempted hours and 28 earned hours entered in the calculator meaning their completion rate is 62% (after rounding). NOTE: Round up to a nearest whole number. Total Hours Attempted: Total Hours Completed: Completion Rate: % NOTE: Round up to a nearest whole number. Are you a student receiving financial aid and considering dropping a class or completely withdrawing? Below are just a few things you should know before you withdraw. All students are required to successfully complete a minimum credit hour and minimum GPA in order to receive financial aid funds each semester. Failure to do so can endanger your ability to receive financial aid for future semesters. More information about Satisfactory Academic Progress. Return of Financial Aid Funds: You may be required to repay a portion of the aid you’re received causing you to owe a balance to the university. Outstanding Student Account Balance: Monitor your student account balance before and after you withdraw. You are responsible for any account balances. Outstanding balances can prevent you from registering, receiving an official transcript, plus much more. Several types of financial aid such as Federal Pell Grant and Direct Student Loans have limitations regarding the amount of funds you can receive in your lifetime. Once they are used, you cannot get those funds back; therefore, the longer you delay, the more you pay for your education. Students who are no longer enrolled at least half-time will be required to begin repaying their student loans after their 6-month grace period has ended. In addition, Exit Loan Counseling will be required to be completed at https://studentloans.gov/myDirectLoan/index.action. It is important that students always know their student loan history. This information is always available at www.nslds.ed.gov for every loan at any institution attended. I am completely withdrawing from all my classes this semester (Total Withdrawal). I am only dropping one or more classes (Partial Drop). Stay on track, keep your financial aid intact! A&M-Commerce enters into third-party agreements with organizations who contractually agree to pay tuition/fees for students. Third party transactions typically involve government agencies, private foundations and public corporations. Receive a written notification from a sponsor specifying the amount of tuition/fees covered for each term. Deliver or mail a letter of authorization to the Student Accounts/Financial Services Office authorizing the university to invoice your sponsor for tuition/fees charges. Note: Letters of authorization must reach Financial Services by semester payment deadlines to prevent schedule removal. Follow the instructions to add a third-party user. Email the Billing/Receivables Coordinator or call 903-468-3089 for additional information. Students wanting to add a course(s) after the fourth class day of a regular 16 week semester, the second class day of a 4 week summer semester or the first day of a mini-semester should pick up a drop/add form at the Registrar’s Office or use the online Drop/Add Form. Students should proceed to the appropriate department(s) to obtain department/instructor approval and then to the appropriate dean for approval. The drop/add form is then returned to the Registrar’s Office for processing. No courses may be added to student schedules after the census day except in very special cases and then only by approval of the instructor and appropriate dean. Students who wish to drop a course are responsible for initiating this action. It is not the responsibility of the university to drop students from their courses as factors such as financial aid can be affected. Eligible students may use their MyLeo to process drops online until the drop deadline. Students not eligible to use MyLeo must complete a Drop Form. If a student has an advising hold, the advisors signature must be obtained on the form. The form should be returned to the Registrar’s Office for processing. Students are encouraged to keep a copy. The term “drop” is used when students are enrolled in more than one course and would like to drop one or more of their classes (while remaining enrolled). Students are not allowed to drop their last or only class after the first class day. In that case, please see Withdrawing from All Courses. Students may drop a class with a full refund (if remaining enrolled) until the census day* of the particular term. A student has one year from the first day of a semester to appeal a drop request. *Census date is the twelfth university class day of fall or spring, fourth university class day of summer or second university class day of a mini-term. For full-term and other shortened format or sub-term classes, please see Important Academic Deadlines on the Academic Calendars. Deadlines are listed by sub-term and number of weeks. Please call 903-886-5068 if you have any questions or have trouble locating the drop/add information. *Effective Fall 2008, a course dropped after the census date in a term will receive a grade of Q. Drops with Q grades will not affect the GPA overall status, but are counted as attempted hours and count towards the 6-drop rule, three-peat, 45-hour and 30-hour rule. Graduate students are not subject to these rules but will have the advantage of the Q grade. *Prior to Fall 2008, a course dropped after the census date in a term received a grade of DP (Drop Pass) or DF (Drop Fail) at the end of the term. A drop pass did not affect GPA, but drop fail grades were calculated as an F and affected the GPA overall status. Courses dropped with grade were counted as attempted hours and counted towards the 6-drop rule, three-peat, 45-hour and 30-hour rule. It is the prerogative of faculty to drop students from courses in which they have accrued excessive absences as defined in the course syllabus. In such cases, faculty recommend through the department head and the appropriate college dean that a student be dropped from a class. The faculty member will document absences and will make a reasonable effort to communicate with the student prior to recommending the drop. If approved, the college dean will forward the recommendation to the Registrar’s Office. The drop must be received within the stated deadline for a drop for any particular semester. *Class days refer to university class days, not particular class days. **For example: If a class meets MWF, the twelfth class day is not the twelfth time the class meets. It is the twelfth school day after classes begin (holidays and weekends excluded). 100 percent refund for dropping a class prior to class start date. Beginning first class day, students must withdraw since they are only enrolled in one class. No refunds for dropping classes after class start date. Refunds will be the applicable percentage of the total fees due for the semester, less any amount not paid. If a scheduled course fails to make by reason of lack of required students, all tuition for that course will be refunded. Late fees and installment fees are not refunded. No refunds will be made unless the application is made within the same school year as withdrawal. No refunds will be made on auditor’s fees. Dropping a course may affect your financial aid and/or scholarships. Please check with the Financial Aid and Scholarships Office to determine your status before proceeding with your drop request. Students wishing to withdraw from all courses before the end of a semester or summer term for which they are registered must clear their record by completing the Withdrawal Form or completing it at the Registrar’s Office. This form only withdraws a student from the semester, not the university, and must be completed even if the student is only enrolled in one class. The form must be completed by the last day to drop a class or withdraw as indicated on the Academic Calendar under Important Academic Deadlines. Any student who withdraws from the university is subject to the conditions outlined in the section regarding Scholastic Probation or Suspension. Students are responsible for withdrawing from classes if they do not plan to attend during the semester in which they have enrolled. All withdrawn courses count as attempted hours and towards the three-peat, 45-hour and 30-hour rule. No refund on the seventh day of class of the session and thereafter. **For example: If a class meets MWF, the 12th class day is not the 12th day of the student’s actual class, it is the 12th day of the university class days. See Important Academic Deadlines for specific dates. Students have one year from the first day of a semester to appeal a withdrawal refund. Withdrawal refunds for students receiving federal funds are based on how much Title IV aid a student has received and not earned at the time of withdrawal. The amount of aid earned is calculated on a pro-rata basis through 60 percent of the term. Contact the Financial Aid Office before withdrawing for additional information about this law. If you are considering dropping a class, you need to know how this can affect your financial aid and much more. If you do not meet SAP standards, you will lose your financial aid eligibility. Students are required to successfully complete 67% of the classes they attempt along with the minimum GPA requirement for your classification. For more details see Satisfactory Academic Progress. Students that drop a class on or before the census day of the semester may no longer be eligible for all the financial aid they originally received. Several awards such as the Federal Pell Grant and Direct Loans have enrollment requirements in order to receive them. The Financial Aid Office will adjust your award accordingly and any funds that have been disbursed will result in a balance owed to A&M-Commerce. A&M-Commerce students receiving financial aid at A&M-Commerce and who are interested in 1) taking coursework at another school to transfer that coursework back to A&M-Commerce and 2) getting financial aid at A&M-Commerce for that coursework may be able to do so through the Consortium Agreement process. Through the Consortium Agreement process, A&M-Commerce serves as the “Home” school. The other institution serves as the “Host” school. The consortium agreement officially notifies us that you are registered, the class is in your degree plan and that you will submit transcripts at the end of the class to A&M-Commerce. The consortium agreements are not processed until after census day, which is the 12th day of class. Spring & Fall Consortiums will require no less than 6 credit hours of enrollment at A&M-Commerce to be eligible for processing. Summer Consortiums will not require enrollment at A&M-Commerce. Only federal financial aid will be applicable. For consortium agreements to be reviewed and processed, they have to be submitted at least 30 days prior to the A&M-Commerce last day of class for the term (see dates below). Transcripts have to be received by the Admissions Office no later than 30 days after the A&M-Commerce term end date (see dates below). The student needs to complete part 1 of the Consortium Agreement form. The student’s academic/faculty advisor completes part 2 of the Consortium Agreement form. The Financial Aid Office at the “Host” institution completes Part 3. The Financial Aid Office at the “Host” institution or the student submits it to the A&M-Commerce Office of Financial Aid and Scholarships. A student on a Consortium Agreement is responsible for and agrees to provide information updates and documents to ensure their Consortium Agreement remains valid to continue to receive financial aid. The student is responsible for reporting enrollment changes and providing such changes within two days of when the change occurs. The student is responsible for submitting official academic transcripts showing completion of the coursework taken through the Consortium Agreement to the Admissions Office at A&M-Commerce. If transcripts are not received in a timely manner, the aid that was disbursed as a result of the consortium being processed will be returned which will create a balance that will have to be paid. For further information or questions regarding Consortium Agreements, please contact the Financial Aid and Scholarships Office at FAO.Web@tamuc.edu. A&M-Commerce students receiving financial aid at A&M-Commerce, interested in taking coursework at another school during the summer and transferring that coursework back to A&M-Commerce, may be able to do so through the Summer Consortium Agreement process. A&M-Commerce serves as the “Home” school and the other institution serves as the “Host” school on the Summer Consortium Agreement. *Students will only be eligible for remaining Pell grant and/or unused Federal Loans. The coursework to be taken must transfer back to A&M-Commerce and be applicable to the student’s degree at A&M-Commerce. The coursework must be approved by the student’s A&M-Commerce academic advisor. The student cannot be receiving a Federal Pell Grant at the other institution. The student is responsible for the tuition and fees at the “Host” institution. Part 1 is completed by the student. Part 3 is completed by the Financial Aid Office at the “Host” institution. When all parts are completed, the form is submitted to the Office of Financial Aid and Scholarships at A&M-Commerce. A student on a summer consortium agreement is responsible for and agrees to provide information updates and documents to maintain the validity of their consortium agreement to continue to receive financial aid. The student is responsible for reporting enrollment changes within two days of when the change occurs. The student is responsible for submitting official academic transcripts showing completion of the coursework taken through the Summer Consortium Agreement to the Admissions Office at A&M-Commerce. For further information or questions regarding Consortium Agreements, please contact the Office of Financial Aid and Scholarships at FAO.Web@tamuc.edu. Please use the correct form below if your financial status or your family status has changed since you completed your 2018-2019 FAFSA. Our office will have a similar form for you to complete. If selected for verification and 2017 income tax returns have been filed with the IRS, the student, and parent, if applicable, can update the 2019-2020 FAFSA income data through the IRS Data Retrieval option. Log in to your FAFSA at FAFSA.gov as you will be making a correction to the financial information (income section). Selecting the “already completed taxes” and checking the box “you have filed” will enable you to select the “View Option” to link to the IRS. This will expedite the verification process and no IRS Tax Transcript will be needed. If you are not able to utilize the IRS Data Retrieval option, you will need to request a Tax Return Transcript through the IRS website at Get Transcript . Select the Tax Return Transcript option. Don’t forget to Submit the request! And don’t forget to include your CWID on ALLpages before sending them to our office!? Submitting an appeal, regardless of when the appeal is submitted, does not guarantee approval of the appeal prior to the term that the appeal is for. Students who are on financial aid suspension pursuing an appeal must plan on making alternative payment arrangements with the Office of Student Accounts. DO NOT wait for the results of the review. Though the intent of the committee is to review appeals within 7 to 10 working days of when an appeal is submitted, the volume received may necessitate the process to take longer. It is the student’s responsibility to submit the appeal(s) with supporting documentation. Failure to provide the documentation with the appeal will result in the appeal being returned to the students and a delay in the review process. Select the appropriate appeal form for your suspension type. NOTE: If you are on suspension for the maximum time frame and GPA or completion, you must submit both appeal forms. If you are on suspension for your GPA and/or you did not complete the required hours for the term or you withdrew from all classes, use this appeal form. Financial Aid Excessive Hours/Time Frame Appeal: If your suspension is for the maximum time frame (150% rule), you will use this appeal. Your academic advisor will also need to complete the second section of the form. Do not submit this form until all portions have been completed. Financial Aid Standards of Progress All Fs Appeal Request: If your suspension has resulted due to you earning grades of all Fs in a term, you will use this appeal. You will also need to complete the appropriate Educational Plan Review. Students who complete a semester with all Fs and submit the Financial Aid Standards of Progress: All Fs Appeal Request form will be placed on an educational plan immediately following the semester of all Fs. Students who complete the Financial Aid Standards of Progress: Appeal Request for GPA and/or Completion Hours form may be placed on an educational plan depending on the academic history review. If during the academic history review it is found the student can meet financial aid standards of progress within the next semester, the student will be placed on probation without the need for an educational plan. If in the next semester of enrollment while on probation the student again does not meet financial aid minimum standards of progress, the student will be required to meet with a representative of the academic advising center and establish an educational plan. Use this form if you receive an athletic scholarship and are appealing for the prior term. Use this form if you are in receipt of a university scholarship and are appealing for the prior term. 2. You have completed 6 credit hours or at least 67% of the credits you have attempted for the term at A&M-Commerce. Full-time enrollment for undergraduate students is considered 12 credit hours or more. DIRECT COSTSDirect Costs are costs that are billed to the student by the University and show up directly on the student’s bill. These charges will need to be paid to the University the Friday prior to the start of each semester. If you are a student living on campus with a meal plan then you will have University charges for tuition & fees, students selected campus housing & meal plan. Housing charges and meal plan costs shown below are averages. Costs will vary based on the student’s selections. *Estimated costs for books and supplies for the academic year, vary based on the program the student is pursing, courses taken and how they are purchased. Some courses and majors require more supplies than others; such as printing, copying or software costs. Indirect Costs are estimated educational costs that students may have and will not show on their student bill from the University. No money is paid directly to the University for estimated indirect costs. FULL-TIME UNDERGRADUATE STUDENT ENROLLMENT DURING THE ACADEMIC YEARFull time enrollment for undergraduate students is considered 12 credit hours or more. Full time enrollment for undergraduate students is considered 12 credit hours or more. Graduate students are considered full time at 9 credit hours or more. Direct Costs are costs that are billed to the student by the University and show up directly on the student’s bill. These charges will need to be paid to the University the Friday prior to the start of each semester. If you are a student living on campus with a meal plan then you will have University charges for tuition & fees, students selected campus housing & meal plan. Housing charges and meal plan costs shown below are averages. Costs will vary based on the student’s selections. Estimated costs for books and supplies vary based on the program the student is pursuing, courses taken and how they are purchased. Some courses and majors require more supplies than others; such as printing, copying or software costs. INDIRECT COSTSIndirect Costs are estimated educational costs that students may have and will not show on their student bill from the University. No money is paid directly to the University for these estimated costs. Graduate students are considered part-time if enrolled between 6-8 credit hours. Please Note: Students who are enrolled on a full-time basis as of census day will have their costs adjusted to reflect their full-time enrollment status. Direct Costs are costs that are billed to the student by the University and show up directly on the student’s bill. These charges will need to be paid to the University the Friday prior to the start of each semester. Estimated costs for books and supplies vary based on the program the student is pursing, courses taken and how they are purchased. Some courses and majors require more supplies than others; such as printing, copying or software costs. INDIRECT COSTS Indirect Costs are estimated educational costs that students may have and will not show on their student bill from the University. No money is paid directly to the University for these estimated costs. Students interested in applying for financial aid will need to complete the Free Application for Federal Student Aid (FAFSA). The application period begins on October 1 of each year for the following academic year. Students are encouraged to complete the FAFSA as soon as possible for each academic year. Eligible to pay the Texas in-state tuition rate, not due to waiver such as an in-state scholarship or an assistantship. To receive the best possible combination of financial assistance, an applicant should submit all required application forms to the Office of Financial Aid and Scholarships by the priority deadline dates listed below. Applications received after these deadline dates are awarded based on funds available. Complete the Free Application for Federal Student Aid as soon as possible. It is available October 1st each year. The FAFSA must be completed each spring in order for you to receive financial aid for the upcoming academic year. If you don’t already have a FSA ID, apply for one now. You’ll need a FSA ID to electronically sing your FAFSA. If you’re a dependent student, one parent should also apply for a FSA ID now so that they can electronically sign your FAFSA. You may also obtain a paper version of the FAFSA from your high school counselor or from the Office ofFinancial Aid & Scholarships. Please note that the paper FAFSA can take 3-5 weeks to be sent to Texas A&M University-Commerce. You’ll receive a Student Aid Report (SAR) Information Acknowledgment in the mail about 2 weeks after submitting your online FAFSA. Or, if you provided a valid email address, you’ll receive an email with a link to your SAR information on the Web within 5 days. When you receive your SAR read the comments section and review. If you find any error correct them. Remember: If you are a dependent student, your parents must sign the correction also. *Applications for assistance cannot be fully considered until all of the required application forms are received by the Office of Financial Aid and the applicant is fully admitted as a regular degree-seeking student. Contact the Admissions Office for admission information. Texas A&M University-Commerce officially corresponds with students through their assigned A&M-Commerce email account myLeo.